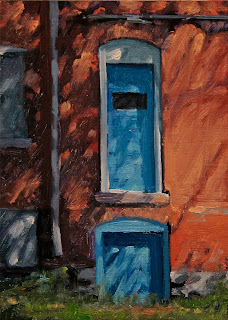 Today's daily painting is of sunlight and shadows on the side of a building with a blue door in Brush Park. The forty-eighth painting in the Abandoned Detroiti series. 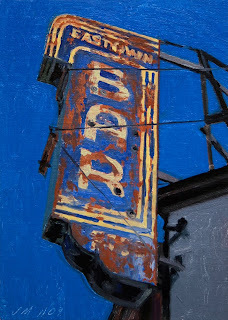 Today's daily painting is of the weathered sign for the Eastown Bar at the corner of Chene and Palmer. The forty-seventh in this series. 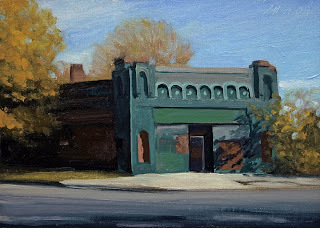 Today's daily painting is an urban landscape with an abandoned Gratiot Ave. storefront the forty-sixth in this series. 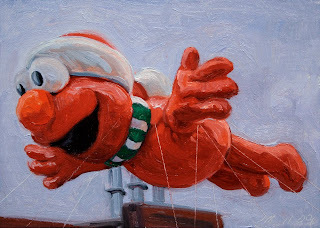 Today's daily painting is a view of the Elmo Balloon flying over Woodward Ave during the Detroit Thanksgiving day Parade. in this series. Have a Happy Thanksgiving and let us be thankful for everything we have and mindful of those with less. 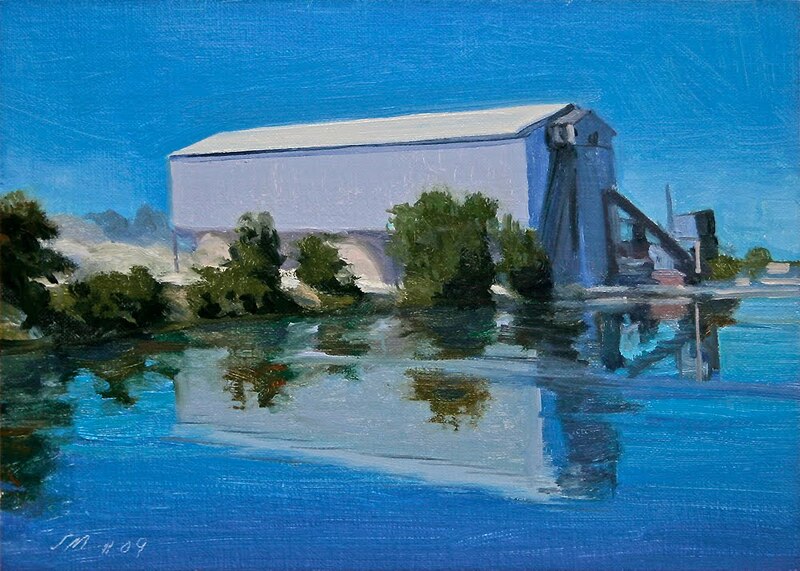 Today's daily painting is an industrial landscape of part of the Rouge reflected into the Rouge River. The river is usually rough here so it was a treat to get this calm water for the great reflection. 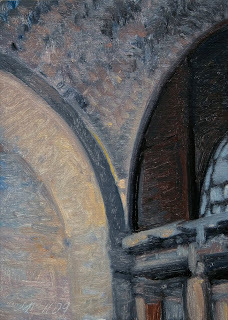 Today's painting is of the arches inside the abandoned Michigan Central Train Station. I am always shocked at the decay inside this once magnificent building. 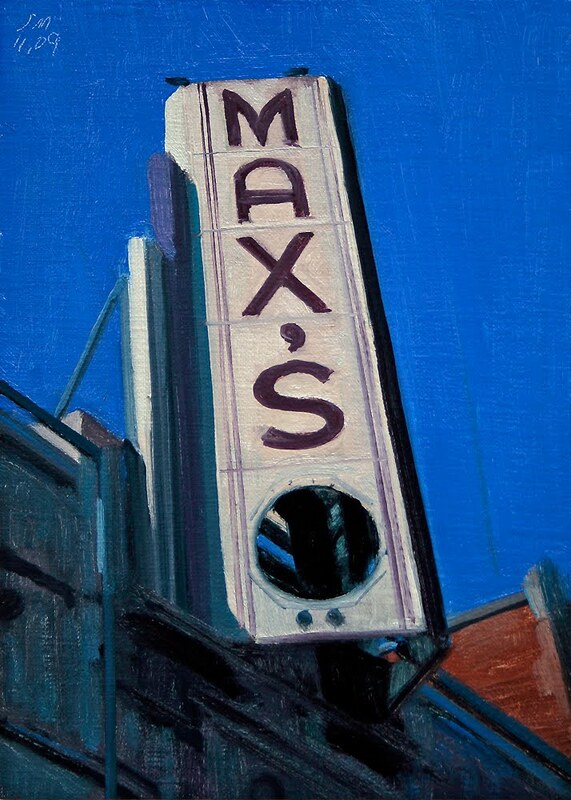 I used a very limited color palette, cad red, cad yellow, chrome green, cobalt blue and white. I was reading about Monet's palette for the water lily paintings and this is the palette he used. 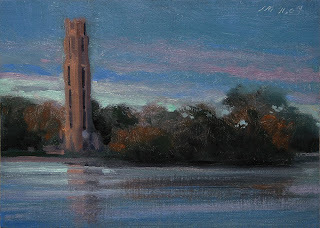 Today's painting is a late evening scene of the Nancy Brown Peace Carillon on Belle Isle. Dedicated in 1940, the carillon rings twice a day. Today's painting is a of the letter "D" it is from the Madison Theater in downtown Detroit. 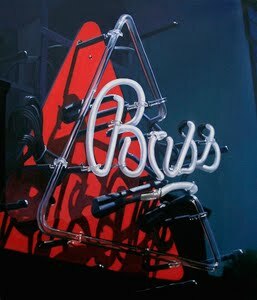 It is for all my friends who's names start with D, too many to name here. 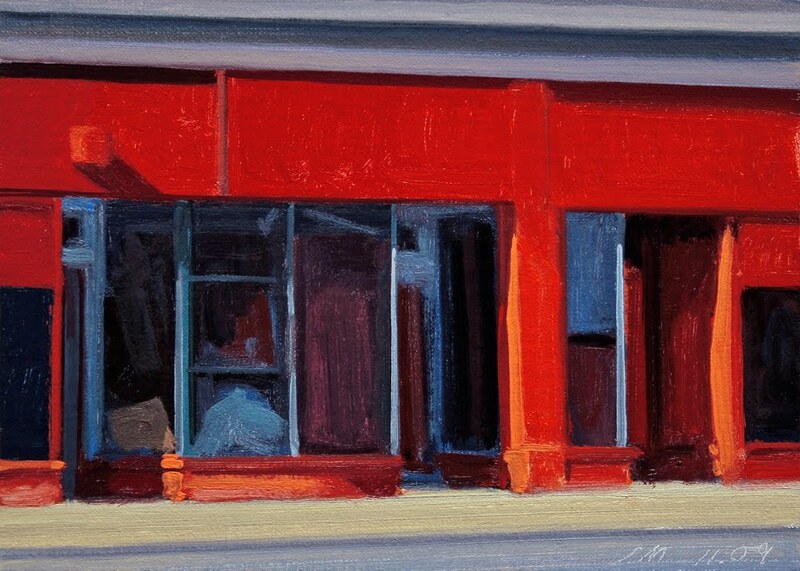 Today's painting is a scene of an abandoned storefront with reflections. 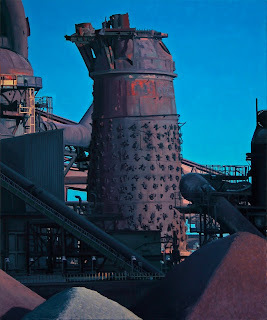 I was interested in the color and contrast in this interesting building. I wish these buildings could tell us their story. Detroit is full of so many similar structures, if only they could talk. At least I can try to give them some recognition and a visual record. 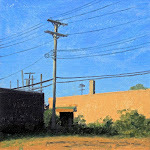 oil on linen/panel, 2009, 36"x30""
This was first done as a 7"x5" study on Postcards from Detroit, on 9.20.09. Today's painting is of a building in Brush Park, a stone's throw from the Detroit Lions and Tigers stadiums. 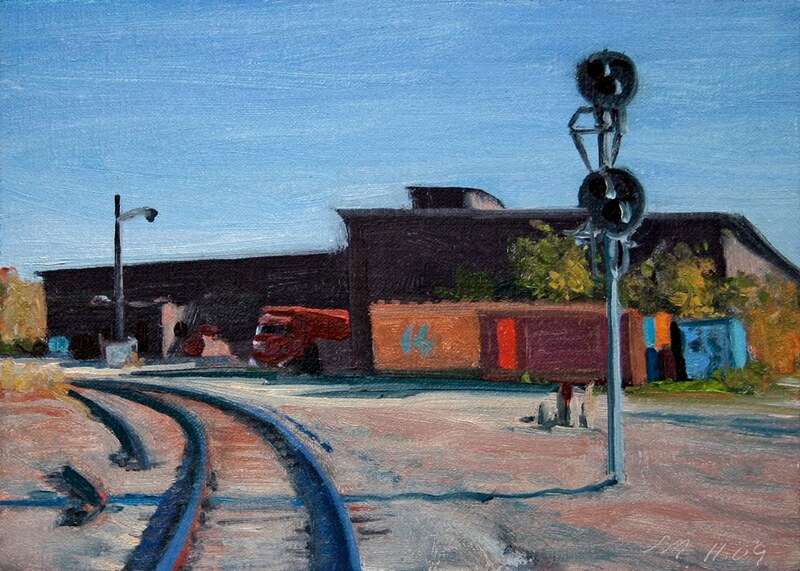 I really liked the deep shadows and hard light in this scene. 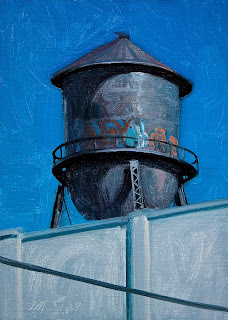 Today's painting is of a watertank with graffiti tags and deep shadows against a cobalt fall sky. Today's daily painting is another Chene Street painting. 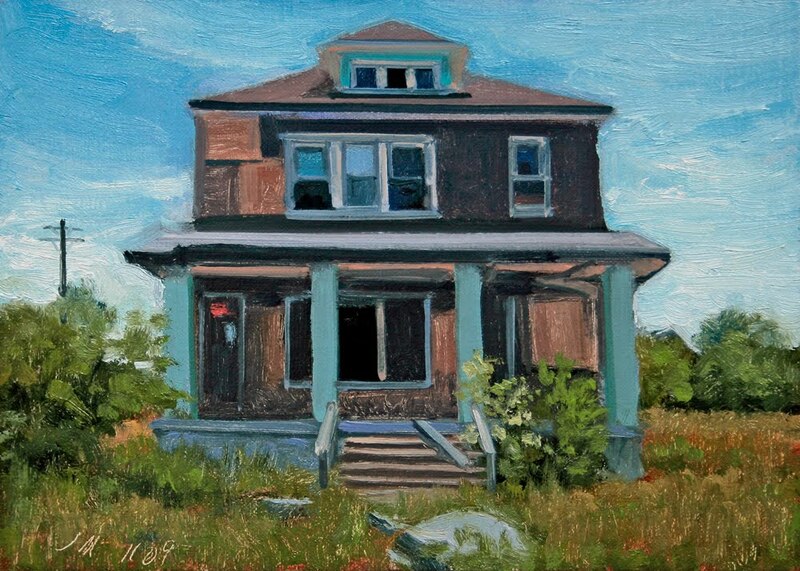 This one has been abandoned for some time also. It is amazing how quickly nature tries to take back what was once hers. Today's daily painting is another Chene Street painting. 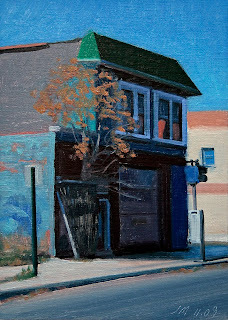 I really liked the mass of this abandoned storefront and sunlit tree. As I started painting I noticed there wasn't a trunk on the tree and after looking closer saw that it was behind the grate growing from within the building. 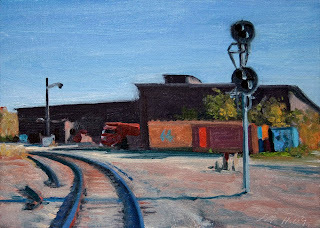 This one has been abandoned for some time. 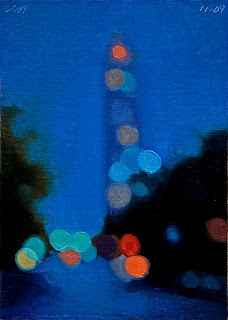 Today's daily painting is another Chene Street painting. 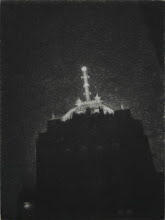 I really liked the mass of this very dark abandoned building and it's shadow. 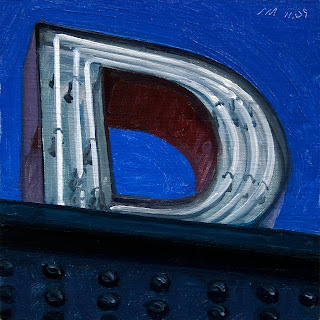 Today's daily painting is a detail of a display of plaster cakes in the abandoned Van Dyke Pastry Shop on Chene Street in Detroit. A few weeks ago my good friend and artist Jack Summers sent me this photo and told me about the cake display. 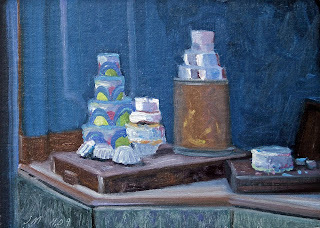 By the time I got to the shop the cakes were gone. So with his permission I have used his photo for this painting. Thank you very much Jack. 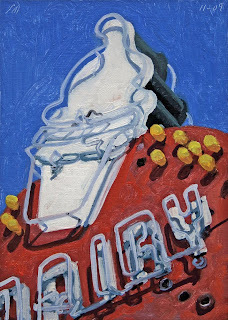 Today's daily painting is a detail of a sign on an abandoned ice cream shop on Detroit's Eastside. It is listed on Ebay as "Late Summer" as I could not use "Indian" in the title. 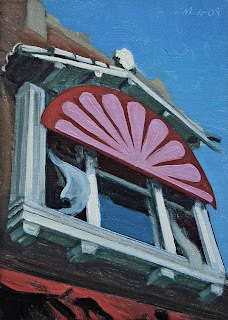 The idea was an ice cream cone for our beautiful Indian summer. 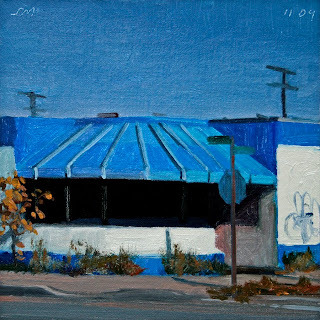 Today's daily painting is a detail of the abandoned Van Dyke Pastry Shop on Chene Street in Detroit. This area of Detroit has really been devastated. 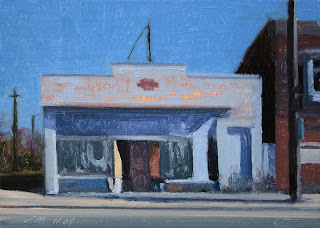 Today's daily painting is of an abandoned storefront on Chene Street in Detroit. This area of Detroit has really been devastated. 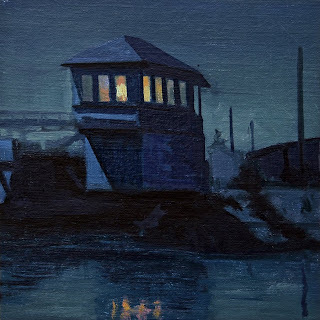 Today's daily painting is a nocturne of the the pilot house for the RR Bridge on Zug Island. 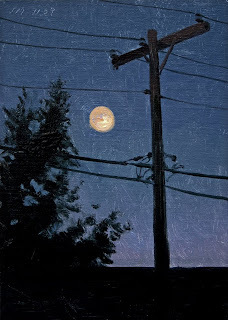 Today's daily painting is a nocturne of the the moon rising over my studio. 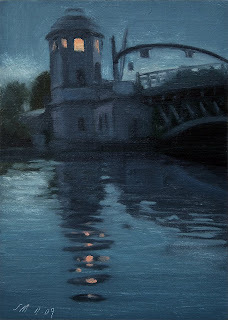 Today's daily painting is a nocturne of the Fort Street Bridge over the Rouge River. 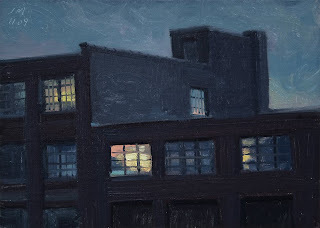 This is the Pioneer Building, a warehouse converted into artists lofts, please check out their site. 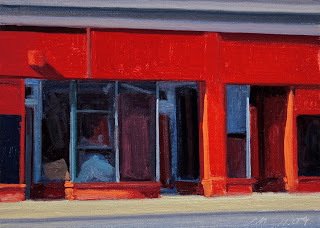 Today's daily painting is a scene of an abandoned storefront. 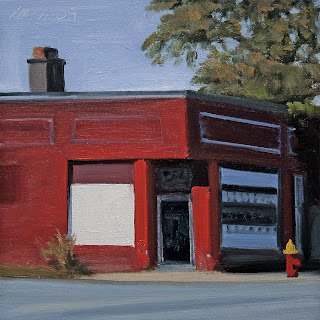 For some reason I couldn't get Little Red Corvette, by Prince, out of my head while painting this one, so I just put in the CD, sorry no I-pod yet. 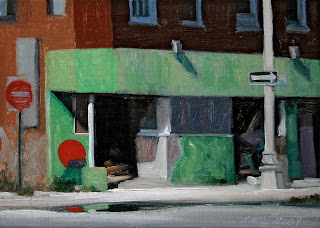 Today's daily painting is a scene of an abandoned storefront on Van Dyke St. 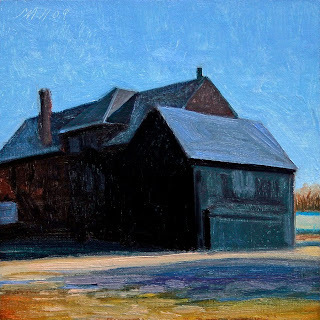 I have painted this building before but the October light gave it a whole different feeling. 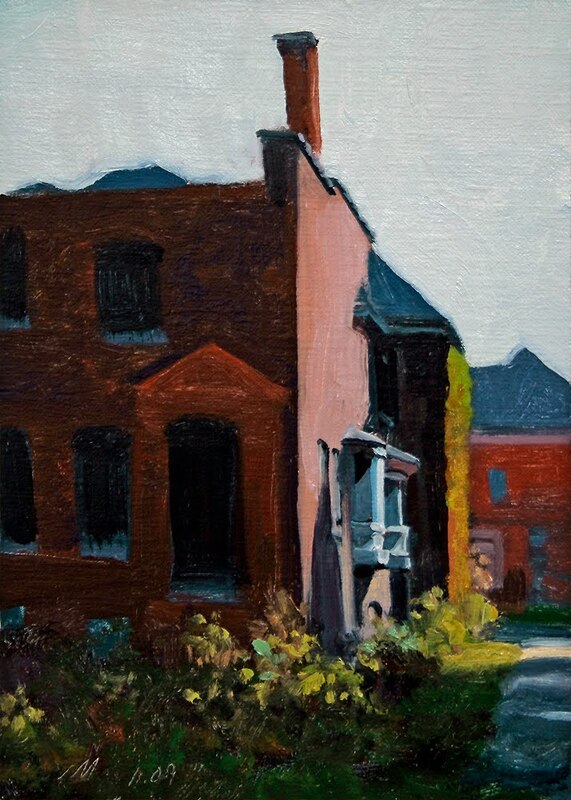 Love the great contrast of the yellow leaves against the dark shadow side of the building. 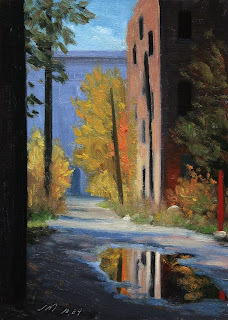 Today's daily painting is a scene of an abandoned Brush Park building reflected in an alley puddle. 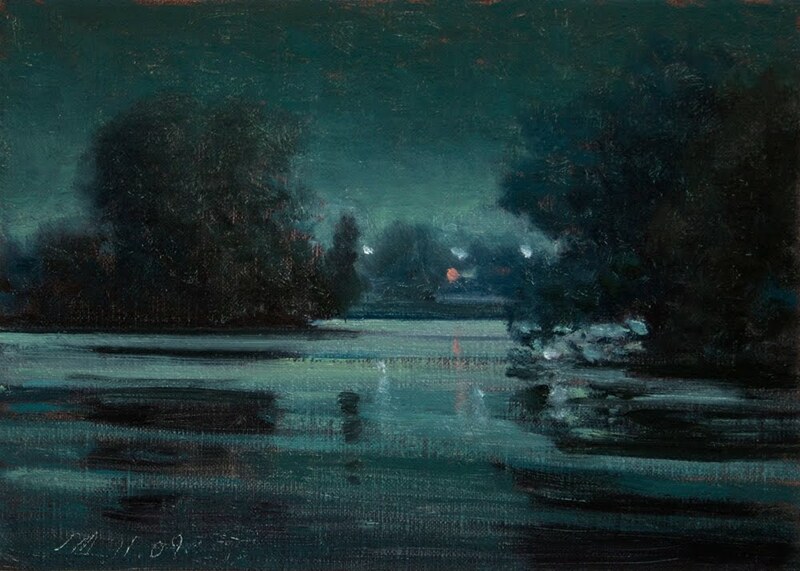 The October light creates such strong contrast of light and shadow.